Meet Bowie! Bowie is a happy-go-lucky, playful and affectionate young pup. He is an excellent fetch partner, gives very enthusiastic cuddles, has never met a squeaky toy he wouldn’t chase and he is quite the accomplished singer. 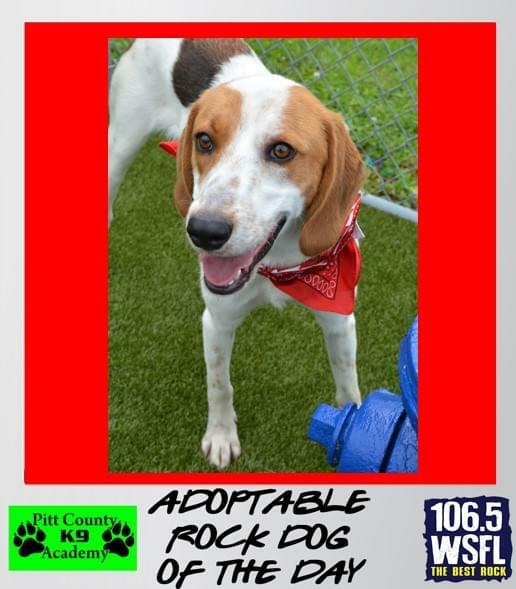 Bowie does like to let out the occasional joyful “a-roo” when he is happy at play, and we get a kick out of singing along with him, but he is an overall, happy, adventurous spirit. Bowie would do great in a home with other pups and the more humans to love, the better. He does great with children and cats too! 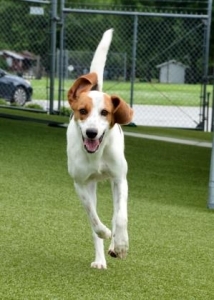 Bowie requires a home with a big fenced yard for lots of play and exercise (and naps in the sun). Apartment living will not suit Bowie well. Bowie is working on learning commands and is very treat motivated and eager to please. He will make an amazing companion for an active family. Bowie is 1 ½ years old, neutered and has tested negative for heartworm disease. He is ready for a second chance at happiness. Ask to meet him today! All adoptions at Onslow County Animal Services include core vaccinations, dewormer, 30-day flea & tick prevention, spay/neuter and microchip. The cost is $140. Click here for more info on Bowie.